The following passage about violence in Jerusalem and recent tensions surrounding the Temple Mount, in an article by John Reed in the Financial Times (Arab-Israel tensions: Jerusalem tales, Dec. 16th), is quite typical of the disinformation about Jerusalem that passes for serious news within much of the British media. Jewish settlers, who get political and financial support from the Israeli state, believe they are reclaiming property inscribed as theirs in history and scripture. Silwan’s overwhelmingly Arab residents see the arrival of the settlers as a form of forceful colonisation, a view shared by Israelis who oppose the settlements. The influx has inflamed emotions among Palestinians already on the defensive from some Israeli rightwingers’ demands for the right to pray at al-Aqsa, Islam’s third-holiest site, and a place reserved for Muslim worship since Israel occupied East Jerusalem during the six-day war. “We are not against Jews,” says Umm Mohammad, voicing the belief that the three monotheistic faiths’ adherents can live in peace. But she says “al-Aqsa is a sacred place — it’s where the Prophet Mohammed went up to heaven. First, Reed and his protagonist, Umm Mohammad, seriously misread readers by failing to mention that al-Aqsa, the site where Jewish “right-wingers” are demanding the right to pray, is of course also known as the Temple Mount, the location where the first and second Jewish Temples stood, and thus the holiest site in Judaism. Jewish “radicals” at the Temple Mount? Indeed, a uniformed Financial Times reader would likely be misled by these passages into believing that radical Jews are attempting to stir trouble, and heighten tensions in the holy city, by encroaching on a site which is only sacred to Muslims. Despite claims to the contrary, it’s hard to understand how the fierce determination to ban Jews from praying at their holiest site, and the insistence that the site (sacred to Jews, Christians and Muslims) should only be reserved for Muslim prayer is anything other than an expression of intolerance and religious bigotry. There are indeed good practical reasons to maintain the status quo at the Temple Mount (where Jews can visit but not pray), but let’s be clear about one thing: the extremists in this Reed’s tale are those who would riot and engage in violence at the mere sight of Jews peacefully praying to G-d at the spiritual epicenter of their faith. Obviously the Jews must be the bad guys, ask the EU. Hamas taken off EU terror blacklist. Enough of this ‘terrorist organisation’ from you lot then! About time! If you know how to read they’ll be back on it in 3 months once they’d review it. This is why their assets are still forzen. Since when can gorillas read? As an African American I find your gorilla comment deeply offensive, you racist cu*t.
Even as a troll you fail, Tamara. Sad. It reinvents itself as an African American to suit itself. Just great. Even if true, Tamara, nobody on this site could possibly have known that, so the description of you as a gorilla was merely a comment on your intellectual capabilities. Personally, I think that is insulting to gorillas, as so far as I know, they don’t hate people because of their faith. I see you more as pond scum. Thank you for showing us your belief that Africans are like gorillas. Bigotry is never has a singular object – and you proudly serve the best demonstration. This is the problem with lying – if you are an idiot with the brain of an amoeba (a strictly Caucasian one!) – you can’t remember your lies. Oh, what a tangled web it weaves, when it first practices to deceive. I somehow have serious doubts about the lady’s familiarity with the author of Ivanhoe. I have my doubts that it is even a lady. An African American gorilla? Really? Did you sign your passport with your thumb print, dear? Lady Tamara .. ” As an African American I find your gorilla comment deeply offensive , ” How did Leah know you were Afro American? I’ve always admired consistency, but in your case to be consistently stupid is beyond belief and reaching the limits of my tolerance. “Today’s EU General Court judgment is procedural and does not mean the EU and UK have changed their position on Hamas. The effects of the EU Hamas listing, including asset freezes, remain in place. “We are studying the detail of the judgment carefully, and will work with partners to ensure that the Hamas listing at the EU is maintained. Now as you are a self confessed retard He/She/It ‘Tamara’ go and get an adult to explain to you what this means. If I were you I would not start handing out the sweets yet or parade again through the streets with weapons as your Hamas friends did three days ago. Gerald, your point is absolutely correct, but in this case, I wouldn’t lambast Tamara for her lack of understanding. I was also of that impression until your post led me to read the articles published more closely, and from reaction I have seen on social media, the general belief seems to be that the EU no longer considers Hamas to be a “terrorist organisation”. This is, as you have stated, emphatically NOT the case – which is a rare piece of good news. Labenal I suggest you read through previous posts by the self confessed ( yes, self confessed) retard He/She/It ‘Tamara’. When you have done so, I have no doubt that you will also lambast the self confessed retard not only for its ‘lack of understanding’ but for its existence on this planet where it is taking up valuable space and using up valuable oxygen. Don’t get me wrong, Gerald. I think Tamara is pond scum and has the intelligence level to match. I am simply saying that on this occasion, it is not the only one who may have misunderstood the implications of this story. Labenal, If He/She/It ‘Tamara’ the self confessed retard had “misunderstood the implications of this story” then I would agree with you. But there is a huge difference between misunderstanding and wilfully misinterpreting something, more so when the misinterpretation is influenced by wishful thinking. Labenal even for a ‘gooner’ you really are a ‘closet bleeding heart liberal’, no wonder you support lost causes such as North London’s second best football team. It is quite simple for the peaceful followers of Islam. 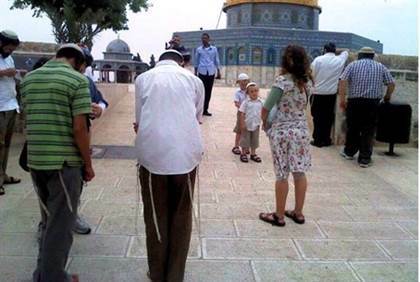 Stand up for the right of Jews to pray at the Temple mount. Congratulations to the cosmetology department at the Financial Times. I don’t know about this…While I think that all prayer is uplifting, I don’t think it works as well if it’s more for provocation and protest and to prove a point. Sure, for the peaceful it is a provocation.